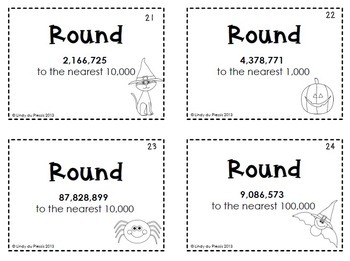 You will receive 32 task cards that ask students to round numbers to any given place. There is a full color and a black and white version. 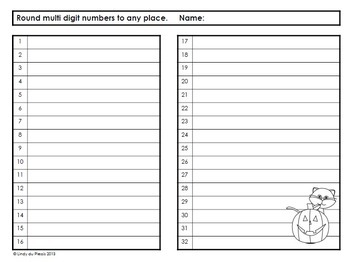 Also included is a student answer sheet and an answer key. 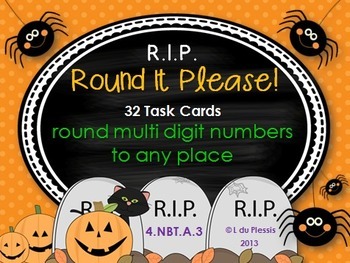 Task cards are very versatile. 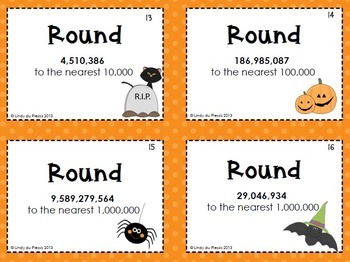 You can project them for whole class practice, use them in small groups or play scoot with them. Copyright © L du Plessis. All rights reserved by author. This product is to be used by the original downloader only. Copying for more than one teacher, classroom, department, school, or school system is prohibited. This product may not be distributed or displayed digitally for public view. Failure to comply is a copyright infringement and a violation of the Digital Millennium Copyright Act (DMCA). Intended for classroom and personal use ONLY.